Basseterre, St. Kitts (CUOPM) — Retired law enforcement officers in New York have expressed thanks to Commissioner of the Royal St. Christopher and Nevis Police Force, Mr. C.G. 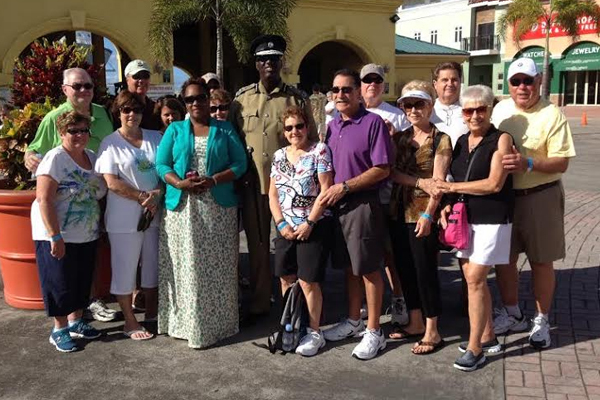 Walwyn when they visited St. Kitts last week. “We were all impressed with your beautiful island. It is the jewel of the Caribbean. Thanks for taking the time out of your busy schedule to meet up with us. The “Thin Blue Line” extends everywhere. It was a pleasure to meet you and your lovely wife. Stop by The Villages, bring your golf clubs and we will show you around. Stay well and be safe,” wrote Retired Sgt. Robert Prince on behalf of the group.